You might have noticed that the Cambridge Dictionaries Online website is looking a bit different this morning as we have rolled out the new design to all devices. Pretty much everything has changed, if you consider the visual impact of the site and its ease of use. We have renamed Cambridge Dictionaries Online to simply Cambridge Dictionary, and its new strapline “Make your words meaningful” is an open invitation to explore the richness of the site’s resources: from definitions and grammar to synonyms and real-life examples. We have also given the site a brand new visual identity including the logo with Cambridge University shield, which now position the site in a direct relationship with the Cambridge English family of products. It has taken an intense 4 months to steer the project from brief to delivery, and an endless amount of tweaks to the interface in order to ensure that all design elements are clear and easy to navigate. In making this change, the team kept the user at the heart of the project making sure that all decisions were based on data and any assumptions were validated through continuous testing. During the 3 weeks of beta testing in June, we invited a percentage of site visitors to view the new design and share their comments through a feedback button. This gave us a chance to iron out any inconsistencies, fix bugs and eliminate major problems before going live. 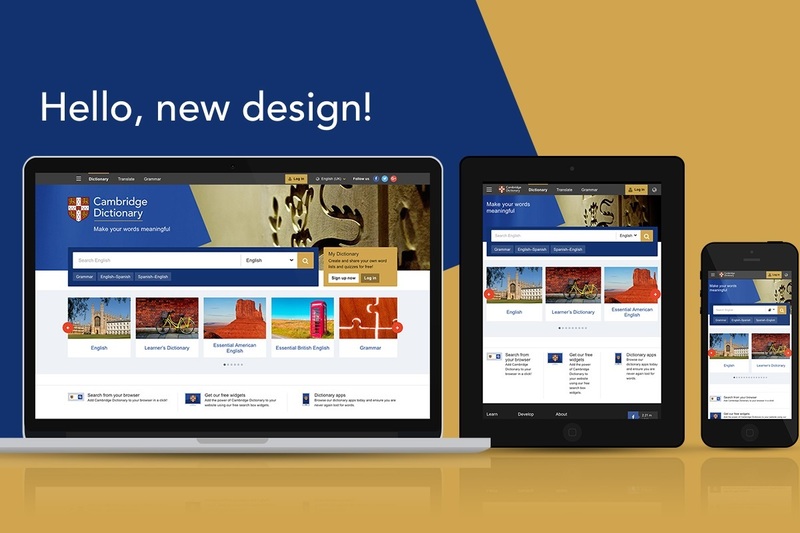 To our delight, 91% of users told us that the new design met their needs and 70% found it extremely appealing or very appealing. As an extra step towards making the site fully optimised, we have planned a series of usability tests, where we’ll observe and listen to real customers as they use the site and tell us about their experience. With 16 million monthly active users, Cambridge Dictionary is Cambridge University Press’s most visited website and one of the top 1,000 Alexa-ranked websites worldwide. It accounts for as many as 77% of visits to the cambridge.org domain and its Facebook community is now over 2 million strong. For me each day it’s better.I’m an English teacher who loved his dictionary and everything you do.I also use and share lots of things you post with my students.I ‘m glad to have the opportunity to use your awesone job. Very nice! Well done Cambridge! Thanks a lot for everything you do for us! Visiting Cambridge site is a kind of addiction for me. But it’s great! A complete hotchpotch between text and path links. Please, try to fix the new page in order that we can carry on printng it flawlessly as before. Hi, do you mean you’re trying to print this blog page, or the dictionary site? Please,try to print this page yourself and see what happens. I don’t know whether this is intended or not. Before the blog update,I had no difficulty in printing the page without any URLs,only the text as shown in the blog page. Hi, thank you for reporting this, we’re looking into it and hope to fix it soon. Way to go!!!! My aunt Wendi Nichols helped create this site! Hi, the thesaurus should now appear as a panel within an entry eg at http://dictionary.cambridge.org/dictionary/english/emoticon – sometimes you will need to expand the panel by clicking on the + at the top left. Then clicking ‘See more results’ will take you to the full topic page. New “Free Chrome Extension” not work at all. Hi, we’re aware of this and working on a fix for it. Apologies for the inconvenience and thank you for letting us know. Would you please fix that. By the way, I couldn’t continue the Ansauro’s thread because there is no ‘reply’ button in the last ( third! ) comment at that thread. It seems that Cambridge have put all our comments out of their mind. As of today (15.07.2016),I have not got a thoughtful answer to my querry, nor have you. Hi Oleg and Ansauro, apologies for the lack of response on this issue, we will look into it as a matter of urgency. The blog is still hosted in WordPress, only the theme has changed so I think it must be a feature of the new theme, hopefully something that can be removed. Hi Oleg and Ansauro, I think I’ve fixed the issue with the link urls printing. Please could you try again and let me know? Thanks a lot — this time I see professionals. Now, it’s fine if not to pay attention to the empty right part of pages. Please try to fix this also, if possible. I’ll wait for a couple of weeks and then finally print those posts published after the site has changed. I’m really grateful for your work. Hi Oleg and Ansauro, I’ve just made changes to the CSS that should remove the wide margin on the right when you print. Please could you check and let me know if te blog is now printing OK for you? Now it looks as perfect as before the site transformation, this is good news for me, thank you very much, best regards. How to remove a button “Feedback”. I use Google Chrome browser. I’ve already done a survey, but button still appears on the screen. It’s boring. Hello, we will be removing the Feedback button soon, and apologise for the inconvenience – we should have added a way to close it. Since the update I haven’t been able to use the dictionary with my students as the phonemic script is not exactly correct for many words. Take, for example the entry for teacher (http://dictionary.cambridge.org/dictionary/english/teacher). The phonemic script for the British pronounciation shows the final r. Do we really pronounce r at the end of the word? I don’t think so. Thank you, we hadn’t spotted this – I’ll report it to the developers. The r at the end of the pronunciation should be superscript, showing that it is only pronounced when the next word starts with a vowel (eg as in ‘My teacher is very good’). pop up window with the double click feature is not working for me, since these changes had happened, is that disabled or what? Hi Milan, do you mean the Chrome extension? Thank you. I’m not a native English speaker and this website have been helped me to read texts from English and American websites. I like to see what other countries think about my country. Thank you very much for your interest in solving the blog page printing issue.This time,you nailed the problem down,except for the large blank right margin which still remains a waste of useful space that can be allocated to text. Please,keep on trying to get rid of it and the page will look like it did before the update. Sure, I hope you appreciate that we are very busy at the moment but I hope to look into this in the next week or two. After spending a week on vacation, It is my pleasure to inform you that your blog printing problem is definitely done away with. I wholeheartedly appreciate your interest in solving the issue.Thanks a lot. No problem, thank you for letting us know!